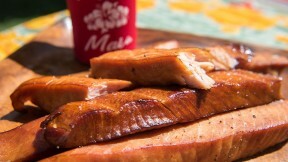 Get the Smoked Fish recipe featured in Family Ingredients on PBS. Combine marinade ingredients in a large bowl with cover. Mix well and add opah belly. Place in fridge overnight. Heat smoker to 200 degrees. Lay fish evenly on smoker rack. Smoke for 2.5 hours or until the fish develops a “bark” or a slightly browned and golden outer layer.